The third time was the Canton charm for Mawae, the 16-year center and eight-year New York Jet who was selected today as one of the members of the Pro Football Hall of Fame's Class of 2019. "It's unreal, surreal right now," Mawae said minutes ago from The Fox Theatre in Atlanta. "We're in the green room right now, getting ready for the start of the awards show. I'm just so excited." The Hall of Fame's 48-member Selection Committee met during the day in Atlanta, site of Sunday's Super Bowl LIII, to deliberate and vote on this year's class. Mawae, who was a Finalist each of the previous two years, was accorded the game's highest honor by being named a Hall enshrinee in his fifth year of eligibility. Mawae was one of 15 Modern-Era Finalists, one Senior candidate and two Contributor candidates whose credentials were discussed by the committee. Word from one of the selectors was that Mawae's "conversation" lasted 24 minutes, 52 seconds, the third-longest of the day behind those of CB Ty Law and contributor Gil Brandt. The entire meeting lasted roughly 7½ hours. The result of that discussion was that Mawae's credentials were thoroughly considered and appreciated by the selectors, who voted him into football's shrine in Canton, OH, along with CB Champ Bailey, TE Tony Gonzalez, S Ed Reed and Law, Senior candidate Johnny Robinson, and Contributor candidates Pat Bowlen and Brandt. Law and Reed, of course, spent time with the Jets later in their careers. Law was a 10-year Patriots corner before making stops in 2005 and again in '08 with the Jets, while Reed finished his career in green and white after 11 stellar seasons with the Ravens and the first half of the '13 season with the Texans. After the awards show, Mawae spoke with reporters about how Jets fans are so center-knowledgeable after watching him and Nick Mangold from 1998-2016. He also said of Hall CEO president David Baker's traditional "loud knock" on the hotel room door to inform him he had been selected, "It surprised me so much that I literally jumped out of the chair and threw my phone across the room," but also said looking back, "It was pretty cool." And he repeated a feeling he's expressed numerous times during and after his playing days with the Jets: "There's no secret that with eight years in New York I'm a New York Jet. I bleed green and white." Jets CEO Christopher Johnson was among Mawae's early well-wishers as word of his selection made the rounds. "Congratulations, Kevin, on earning the game’s highest individual achievement," Johnson said. "When we first purchased the team, Kevin was one of our leaders. What I noticed immediately about him was his passion for the community, his teammates and the game. You could see it in his approach to everything he did — from mentoring his teammates to the ferocious mindset he brought to each game as well as his extraordinary commitment to the communities in New York and Louisiana. All of these factors combined to make Kevin a tremendous person, player and someone deserving of this honor." Mawae joins Martin, the running back who ran behind him for all 45 of his 100-yard rushing games and all seven of his 1,000-yard seasons as a Jet and who was selected for the Hall of Fame in 2012, and Parcells, the head coach who brought both him and Martin to the Jets in 1998 and who was enshrined in the Hall in 2013. Martin, who was in attendance at the NFL Honors show that was being taped for airing on CBS tonight at 9 p.m. (ET and PT), has left no doubt where he stood on Mawae's induction. Others have sounded off in similar fashion on Mawae's induction. HC Herm Edwards — “Kevin was one of the toughest guys I’ve ever been around. He knew the difference between being hurt and being injured. He was a guy who took pride in how he performed. He understood his performance was his résumé every time he walked on the field, he understood the preparation of being a great player. He was a talented player but he was a tireless worker. He is the embodiment of a guy who is worthy of receiving this honor." Mawae spent his first four pro seasons with Seattle, then spent the middle eight seasons of his stellar NFL career wearing the green and white. He compiled ironman streaks of 118 consecutive games and starts as a Jet and 179 straight games and 177 straight starts as a pro before suffering a torn triceps midway through the 2005 season. 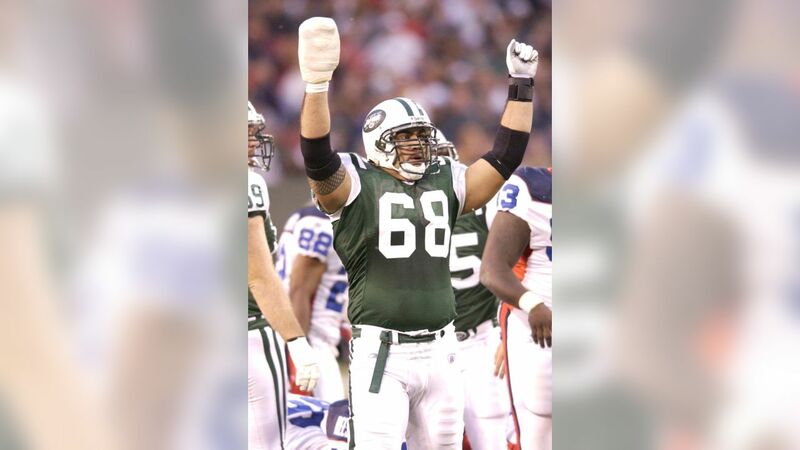 The Jets released him the following March and he finished his NFL career with four seasons as the Titans' starting C.
In all, Mawae was named to eight Pro Bowls, six as a Jet, and was named an NFL All-Pro six times, five times as a Jet. 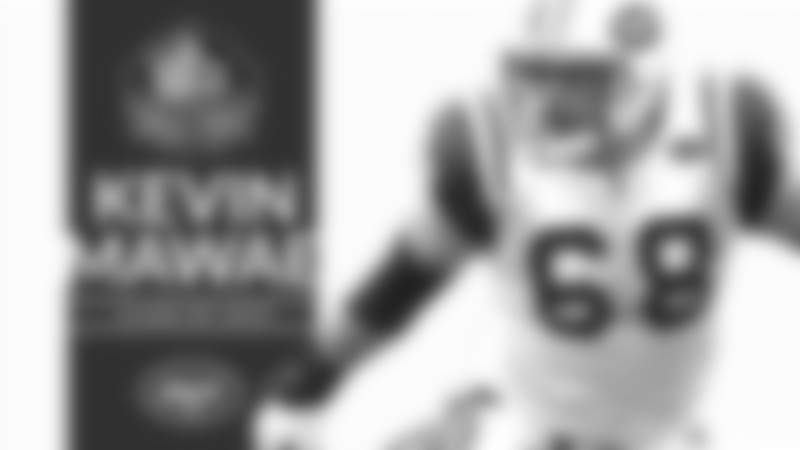 In 2017, he became the 18th and most recent inductee into the Jets' Ring of Honor. Mawae and the rest of the Class of '19 will be formally enshrined on Saturday, Aug. 3, in Canton. And his bust will be displayed in the hallowed Hall of Fame Gallery near the busts of five other Fame-ous men who spent significant or major portions of their careers as members of the New York Jets — Martin, head coach Weeb Ewbank, WR Don Maynard, RB John Riggins, and needless to say, QB Joe Namath, who was also in attendance at the NFL Honors taping in Atlanta tonight to welcome Mawae into the fold.